The Tree Route in the Pretoria National Botanical Garden was launched on 22 May 2010 on the International Day of Biodiversity. This self-guided route starts at the Garden entrance and introduces the visitor to 50 of South Africa’s beautiful indigenous trees. It is easy to follow for young and old and is less than 1 km in distance. You can do this route in less than 2 hrs at a leisurely pace. All the trees are clearly marked with orange labels. 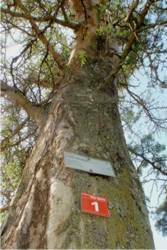 The numbers on the trees can be looked up in the Tree Route booklet which is on sale for R20 at the Garden entrance, and contains colour photos and lots of interesting information about the trees. The Pretoria National Botanical Garden is proud to be the first SANBI Garden to introduce a Braille Tree Route that was launched on 30 October 2010. Braille and large print booklets that enable visually impaired visitors to better experience the self-guided Tree Route were produced by the National Council for the Blind with the generous assistance and sponsorship of the Pretoria Jakaranda Lions Club. The booklets include all the information on the 50 indigenous trees on the route. These guide books will be available on loan at the main entrance of the Garden for a refundable deposit of R20. Users of the Braille Guide will be able to identify the trees by Braille numbers on the Tree Route labels that correspond with the information in the booklet. The Garden already has an Enabling Garden that explains garden design, gardening techniques, special tools and appropriate plant choices for those with disabilities. Thanks to the generosity and effort of the Lions Club Pretoria Jakaranda and the National Council for the Blind, the Garden has now opened itself to a wider spectrum of the community. We are proud to be able to welcome the visually impaired and provide an informative experience for them. It is only appropriate that the route should start off with an Ana tree (Faidherbia albida), one of the remarkable old giants and one of the first trees to be planted in the Garden in 1946. Not far from the entrance the Transvaal gardenias (Gardenia volkensii subsp. spatulifolia) with their fragrant, star-shaped flowers and attractive, ball-shaped fruits, can be seen. The route meanders past the wetland which offers a close-up look at the many water birds that made this their home. 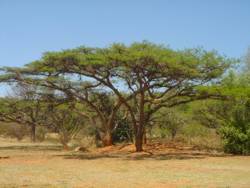 A variety of acacias are found here such as the well-known paperbark thorn (Acacia sieberiana var. woodii) with its stunning flat crown that is so typical of the Bushveld. Take time to smell the pods of the scented-pod acacia (Acacia nilotica) and marvel at the luminous, lime green bark of the fever tree (Acacia xanthophloea), which is also one of the 2010 Trees of the Year. Many handsome weeping boer bean (Schotia brachypetala) trees decorate the lawn adjacent to the wetland and if one takes the opportunity to visit the Garden during spring the splendour of their masses of nectar-rich, deep-red flowers will leave you in awe. 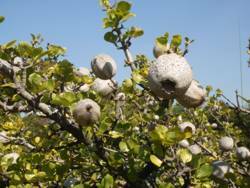 The visitor will walk past the fascinating Bushman’s tea (Catha edulis), its leaves are brewed as tea or chewed as a drug by the Bushmen. A group of velvet bush willows (Combretum molle) will entice you to touch their soft, hairy leaves. Have a good look and you might still see the large 4-winged, papery fruits that remain on the tree after the leaves have fallen in early winter. The leafy forest fever berries (Croton sylvaticus) bear salmon-orange fruits during early winter, which are relished by a variety of fruit-eating birds such as hornbills. Watch out though – the fruit is very poisonous to humans and is traditionally used as a fish poison. The indigenous alternative to the popular Jacaranda tree, called the tree wisteria (Bolusanthus speciosus), can be seen near the Waterfall where the Route ends. The above offers only a glimpse of the many fascinating trees on the Tree Route. We invite you to visit the Garden, do the route and experience first-hand what amazing surprises nature has to offer.